Novartis and GlaxoSmithKline, two of the world's top drugmakers, have struck a multi-billion-dollar deal to join forces and reshape their businesses. The deal involves swapping assets and combining their consumer health units. Novartis will acquire GSK's cancer drugs business for $16bn (£9.5bn) and sell its vaccines division, excluding the flu unit, to GSK for $7.1bn. In a separate deal, Novartis has agreed to sell its animal health division to Lilly for nearly $5.4bn. 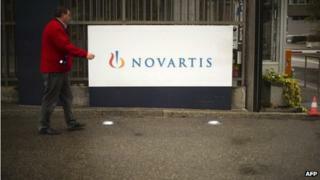 Novartis said the moves would help the firm focus on its key businesses. "The transactions mark a transformational moment for Novartis," Joseph Jimenez, chief executive of Novartis, said in a statement. "They also improve our financial strength, and are expected to add to our growth rates and margins immediately." The deals are a part of Novartis's review of its business as it continues to face sluggish growth. Novartis and GSK said that combining their over-the-counter (OTC) units would help boost the fortunes of both the companies. The combined unit will have annual revenues of £6.5bn. "Opportunities to build greater scale and combine high quality assets in vaccines and consumer healthcare are scarce," Andrew Witty, chief executive, of GSK, said in a statement. "With this transaction, we will substantially strengthen two of our core businesses and create significant new options to increase value for shareholders." GSK said the agreement with Novartis "significantly exceeds GSK's returns criteria" and the transaction "would increase overall GSK revenues by £1.3bn to £26.9bn". Glaxo shareholders will get a £4bn capital return from the proceeds of the deal, the firm said. The tie-up between the two firms came at the same time as Canadian drugs firm Valeant offered to buy Botox maker Allergan for $47bn (£27.9bn). Allergan's largest shareholder hedge fund Pershing Square, run by activist investor Bill Ackman, said it supported the bid. In a statement, Valeant said buying Allergan would help it to drive growth, creating an "unrivalled platform for value creation in healthcare".